Shane Hughes set he men's FKT, 25h26m41s, August 19, 2017. Previously, Brad Ferrier & Travis Morrison had the men's FKT, 25h29m44s, July 22-23, 2016. Still earlier, Chad Brackelsberg had the men's FKT, 26h42m, August 31 - September 1, 2013. Emily Brackelsberg set the women's FKT, 27h24m, August 31 - September 1, 2013. The Uinta Highline Trail runs the length of the high Uinta mountain range through the High Uintas Wilderness in northeastern Utah. It is a true wilderness trail, and does not intersect a road for at least 70 miles. The trail is around 100 miles long, but most backpacking trips are done over a 70 mile section between Chepeta Lake and Hayden Pass. A map of this section, which is entirely above 10,000 feet elevation, is here. A topo map is here. Davy Crockett and Matt Watts set out to run this 70-mile section on August 4, 2007. Their trip was unsupported, which is probably the only practical way to do this route. Davy's detailed report gives an in-depth description of the route. Matt finished the run in 29h44m, with Davy coming in 14 minutes later. Davy Crockett ran a longer (about 80 miles) route starting at the Leidy Peak TH in 33h19m on July 30-31, 2010. Subsequently, this longer route seems to be the "standard". Chad Brackelsberg did this route in 28h16m on August 29-30, 2010. 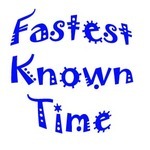 Stephen Jones lowered the FKT to 27h41m49s on July 22, 2013. Chad Brackelsberg reclaimed the men's FKT (26h42m) and Emily Brackelsberg set the first women's FKT (27h24m) on August 31 - September 1, 2013. The pair ran together the Dead Horse Lake, then split up. Bret Ferrier and Travis Morrison brought the men's FKT down to 25h29m44s on July 23-24, 2016. And finally, Shane Hughes posted a slightly faster time (25h26m41s) on August 19, 2017. Each of these trips is reported below. I broke this record on July 30-31, 2010. Did this section in 28:33. Ran it solo. The trail was in much tougher condition, soaking wet. My feet were wet nearly the entire time. 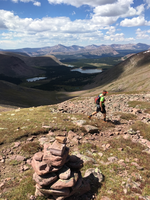 I (Chad Brackelsberg) ran the Leidy Peak Trailhead to Hayden Pass Trailhead on August 29-30 in 28:16. I ran the first 20 miles with Mark Christopherson, then ran solo the rest of the route. I stayed on the new Highline Trail (025) without taking any of the older trails. I believe this added some distance to the route. My total distance was 81.3 miles and ~15,000’ climbing. This may be about 1 mile extra with getting off trail a few times. The trail requires very good navigation (especially at night) as it is not well marked or travelled. For more details of the run, see my blog post at brackblogs.sharepnt.com/archive/2010/09/01/Highline-Trail-Run.aspx. My good friend, 63 year old Eric Robinson from Australia, set off to thru hike the Highline Trail 7.28.11. He was scheduled to finish Sunday 8.7.11. He is now 2 days overdue. No word has been heard from him or of him. Please Call Sherriff Mitchell at 435.738.2015 or Julia Geisler 415.695.4502 if you are available for the next few days to join the search or have any info. Anyone who may have seen Robinson, or volunteers who have time to assist the search, are asked to contact the Duchesne County Sheriff’s Office at (435) 738-2015. 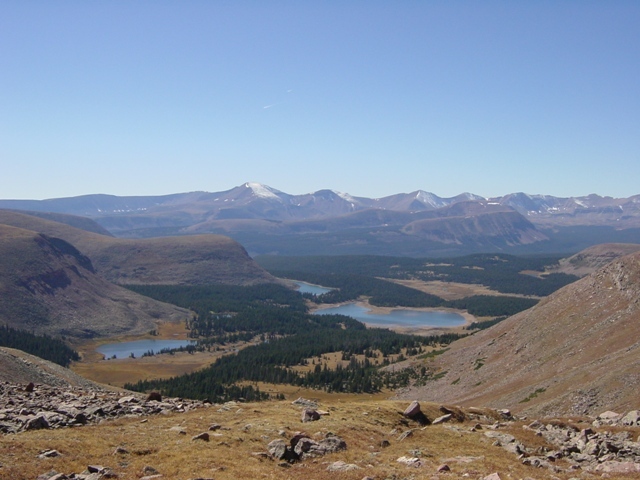 Erik Storheim, Peter Lindgren, Ben Lewis and Jason Berry will be attempting the Uinta Highline Trail from the Leidy Peak Trailhead to Hayden Pass Trailhead beginning Sat July 13 2013. We would like to just finish it, but an FKT would be nice also. On July 22, 2013, I, Stephen Jones, ran the Uintah Highline trail solo and unsupported from Leidy Peak to Hayden pass. 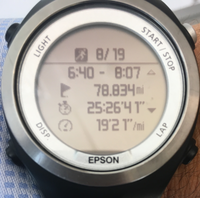 I've heard that the route is 78-80 miles, but with difficulty navigating at night and accidentally back-tracking, my watch read 82.87 miles. I started my watch at the trail marker sign at the Leidy Peak trailhead and stopped my watch when I reached the trailhead registry at the hikers' parking lot at the Hayden Pass trailhead. My time was 27:41:49. My brother in law and myself hiked the Highline from 7-20 to 7-25. The night of the 22nd we were camped at north star lake in Tungston pass when around 10:30 a light hit my tent. what the hell? I looked out to see someone with a hell of headlamp run past my tent, around the lake and start up porcupine pass looking for cairns as he went. In the morning I asked Mark if he saw or heard that guy that ran through camp last night. He said no but has heard of people that run the trail in less than 30hrs. When I got home I looked it up and there you are talking about it. I don't think people relate to how rough that trail is or how easy it is to lose sight of the trail in the daytime let alone at night. Congrats on a feat well done and am glad you are safe! Chad Brackelsberg and Emily Brackelsberg ran the Highline on 31 August - 01 September. We ran together to Dead Horse Lake, then continued alone to set new men's and and women's FKTs. The run was unsupported and we both carried all of our own gear. Details and photos are posted at thebrackpack.com/2013/09/double-fkt-on-the-uinta-highline-trail/. A Spot and 2 Garmin Forerunner 310 XTs were used to track progress. On July 23nd->24th 2016 I, Bret Ferrier and Travis Morrison ran the Uinta Highline from Leidy Peak to Hayden pass. We followed the same route that Stephen Jones did starting our watches at the Leidy Peak trailhead and stopping them at the trailhead registry at Hayden Pass. The run was unsupported with each of us carrying our own supplies and not getting any aid along the trail. On August 19th 2017, I, Shane Hughes ran the Uinta Highline trail with Steve Lindsey and Spencer Weiler unsupported from Leidy Peak to Hayden Pass. We followed Stephen Jones' route loaded in Gaia for navigation. We did not receive any support and filled up water in springs along the trail. We enjoyed sun, rain, wind, lightening, and lots of rocky terrain losing the trail a handful of times. I used an Epson SF-710 watch for tracking purposes. Just before Rocky Sea with 9 miles to go, I set off on my own and finished in 25:26:41 setting the new Uinta Highline Trail FKT. You can view my watch data on the attached image and online at www.strava.com/activities/1143987063/overview.